The late documentarian Les Blank is responsible for a few minutes of film a lot of cinephiles know well, even if they don’t know Blank’s name: It’s the footage of Werner Herzog, on the Amazon-jungle set of Fitzcarraldo, looking beaten-down and dead-eyed as he talks about how nature is “vile and base,” and how the “the trees are in misery” and the birds “screech in pain.” That scene is in Blank’s 1982 feature-length documentary Burden Of Dreams, which became part of The Criterion Collection in 2005. But Burden Of Dreams is something of an anomaly in Blank’s 50-year filmmaking career. Blank’s overall focus wasn’t really on features, and while he did take a particular interest in colorful artists like Herzog, the bulk of his work was shot in the United States. The real Blank legacy is best-represented by Criterion’s packed box set Les Blank: Always For Pleasure, which collects more than a dozen of Blank’s most important films—each between 30 minutes and an hour long—supplemented by the fragments and excerpts that Blank often spun off from his longer projects. The set is a jumble of American music and American images, connected by Blank’s knack for making people comfortable enough around his camera for them to show him who they really are. In Always For Pleasure, what people mostly show is that life can be joyful. Music plays a major role in most of the films in this set, beginning with the first one, 1968’s “The Blues Accordin’ To Lightnin’ Hopkins,” and continuing through films about zydeco legend Clifton Chenier (1973’s “Hot Pepper”), polka parties (1984’s “In Heaven There Is No Beer?”), and Afro-Cuban percussionist Francisco Aguabella (1995’s “Sworn To The Drum”). Blank didn’t just film what was happening onstage, either. He showed the crowd dancing with unselfconscious abandon, and he showed the surrounding communities, paying as much attention to work, kids, and the preparation of food as he did to the songs. Food is one of the other big motifs in Blank’s work. Two of the films in Always For Pleasure are specifically about food: 1990’s “Yum! Yum! 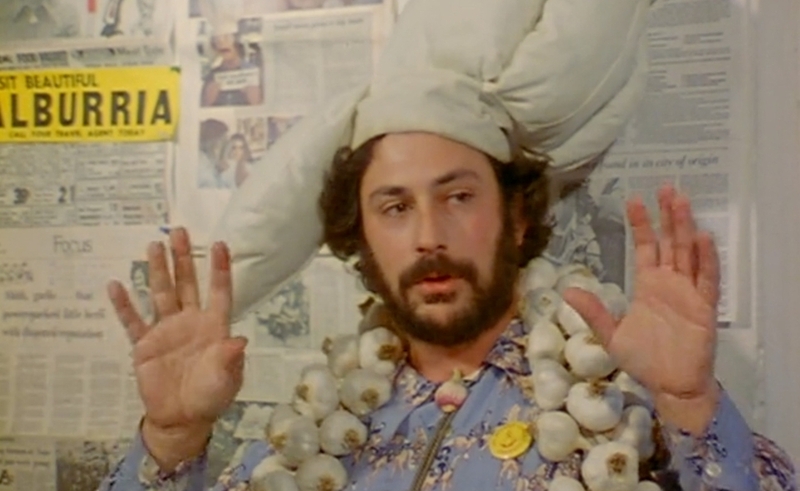 Yum!” and 1980’s “Garlic Is As Good As Ten Mothers.” The latter was one of Blank’s most popular and career-defining films, paying homage to the zest garlic brings to a variety of cuisines; it was shot in and around the San Francisco Bay area where he lived most of his life. But even when Blank was exploring Cajun life in 1971’s “Spend It All,” Creole life in 1973’s “Dry Wood,” and Mardi Gras in 1978’s “Always For Pleasure,” he’d set aside a large chunk of screen time to watch a woman make a pot of coffee—beginning with her roasting the beans—or to observe how to properly fry a chicken or prepare a jumbo-sized dish of red beans and rice. The reason Blank could take that time is that he rarely went into a project with a specific plan in mind. (That’s also why he sometimes had trouble getting the grant money he needed to finish a movie, and why he often spent years working on films that ended up clocking in around 50 minutes.) He’d go in with a vague idea about shooting an artist or a community, and then he’d start asking people questions and getting suggestions about some daily ritual or bit of local color that ought to be preserved. A Southerner by birth—born in Tampa, schooled in New Orleans—Blank spent a lot of years filming the South, often embedding in places where people didn’t have a lot of money. But the films in Always For Pleasure don’t dwell on the misery of poverty. They’re celebratory, zeroing in on the occasions that brighten up anyone’s day: a funny remark, a good story, a catchy song, a cold beer, or a pan of homemade cornbread. These films are so zestful because Blank always kept them loose enough to let them become unique. That’s how he could dedicate an entire movie to his fascination with gap-toothed women (1987’s “Gap-Toothed Women”) and come away with a funny, eclectic, downright inspiring film about self-image and the importance of recognizing uncommon beauty. Blank didn’t start out looking to explore that theme. It’s more like the theme saw he was in the area, and raced to find its rightful place in front of his lens. In keeping with the digressive nature of Blank’s work, the menu for each film in the Criterion set comes with options to watch extended outtakes, or one of the short films Blank fashioned out of the same material, or interviews with some of Blank’s regular collaborators and biggest fans. The interviews offer a wealth of anecdotes about how Blank worked (shooting a hundred times more footage than he used, according to his son Harrod), as well as heartfelt appreciations by Herzog (who says that after watching Blank’s films, “I know more about America than someone who has read 500 books about the country”) and director Taylor Hackford (who says Blank deserves to be spoken of as a folklorist on par with John and Alan Lomax). Most tantalizingly, Always For Pleasure includes a 10-minute excerpt from a work-in-progress documentary about Blank, shot before he died in 2013. There, Blank himself shares some of what drove him: namely his constant worry that when his camera was off, he was missing something important.